The puppy is only very young and will not require much exercise, just allowed to play and rest when he wants to. He is too young to go on walks for the first 4 months, as it places too much stress on growing bones and joints. After the puppy reaches 16 weeks of age, he can go on short walks of approximately 5 minutes duration, around the block or to the local shops, school or park. After the age of 6 months, the puppy can generally be walked more often & slightly longer periods, but must be allowed to rest when tired. In most cases, when the puppy is 12 months of age, he can walk and run as often as you like for longer distances, as he will have achieved his final skeletal growth, and will be starting to develop muscle. Prior to this the puppy has not had enough muscle to support the bones and joints, so walking and exercise should be moderate. Swimming is a part of our dog's exercise regime. All dogs swim by instinct. How much they enjoy this form of exercise depends on how confident the dog is in the water. 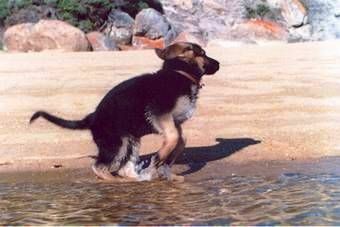 With some dogs it takes some time to build up their confidence, but others take to swimming like a 'duck to water'. Swimming helps to improve stamina, muscle tone & fitness. Swimming is an excellent form of exercise because most of the muscles normally used in movement are involved without the stresses caused by running on hard ground. Careful exercise when young will give you a sound and healthy adult for life! Walking, playing and recreating with your dog not only provides you with some vital exercise, it reduces your stress, increases your social interaction with others, and is good for your heart and general health. When taking your puppy/dog in the car with you, ensure that there is adequate ventilation and DO NOT leave the puppy/dog in the car if you are running errands. Many dogs have suffered heat stroke /brain damage when left in cars in warm weather.